A common treat throughout Latin America, pastel de Tres Leches (three milks cake) takes its name from the three types of milk used in the recipe. Sweetened condensed milk, evaporated milk, and heavy cream combine in a soaking sauce that gives this classic style of tres leches cake a dense, extremely moist texture, more akin to a custard than a traditional light and fluffy cake. The recipe likely evolved from soaked cakes developed in medieval Europe, but it spread in popularity in the 1940s when Nestlé printed a recipe for it on the label of its canned condensed milk. 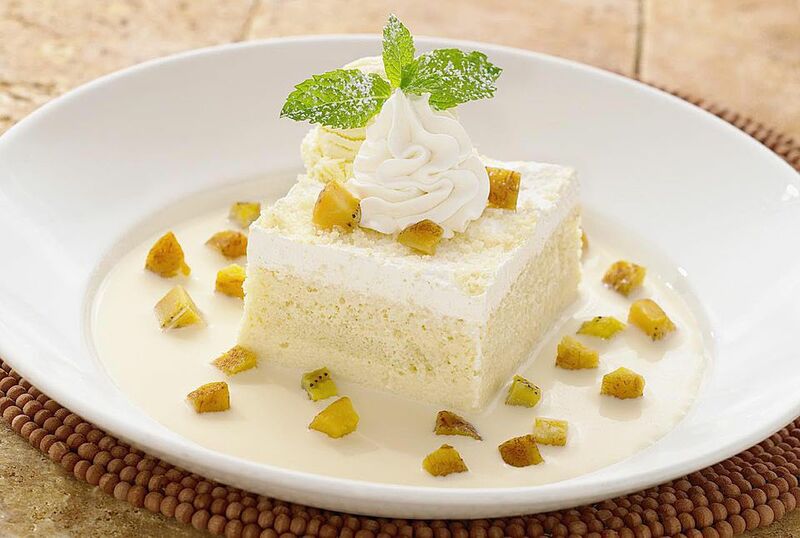 At some point tres leches cake crossed the border into the United States, where it gained near-celebrity status among restaurant chefs in the early 2000s and even became a Häagen-Dazs flavor in 2015. Combine the flour, baking powder, and salt in a large mixing bowl. In a separate bowl, beat the oil, sugar, and 1 teaspoon of vanilla extract until combined. Add the eggs to the sugar mixture one at a time and beat on medium speed until fully incorporated. Stir in 1/2 cup of milk, then gently fold in the flour mixture a little at a time. Pour the batter into a lightly greased cake pan or baking dish, and bake the cake at 325 F for 30 to 40 minutes or until a toothpick inserted in several locations comes out clean. Let the cake cool in the pan to room temperature. Turn it out onto a platter with raised edges. Pierce the cake with a fork 20 to 30 times. Let it cool in the refrigerator for an additional 30 minutes. Make the cream syrup while the cake chills. Whisk together the three milks and the rum or brandy if desired. Slowly pour the liquid over the cooled cake. Refrigerate it for 1 hour, periodically spooning the milk runoff back onto the cake. Make the whipped topping just before you serve the cake. Combine heavy cream, vanilla, and sugar in a chilled mixing bowl. Beat it on high speed until peaks form. Spread a thin layer of the whipped topping over the cake. Top it with a sprinkle of cinnamon or garnish it with fresh berries.